As I reflect on this past Thanksgiving time with our family, I am very thankful for their willingness to carry a very robust and sincere discussion on what we are thankful for as we sat around the Fondue dinner table. The past year has been full of very challenging, difficult and painful experiences including the death of Gail’s father, our father and our children’s grandfather, Richard Anderson on October 9, 2010. This loss has effected all of us differently and is fresh emotionally, still. But as we sat and talked several things came to mind. Today, the whole earth is struggling, pushing and pressing on for the day of delivery from the groaning, the intense labor and daily toil created by the fall of man. Included in this daily struggle are Gods children. All of as believers are not immune from this struggle. In fact, more times than not, how we conduct ourselves in the struggle communicates to others how strong our faith is. We have two options as far as I can tell, to struggle well, or, struggle poorly. We can choose to turn to Christ in our struggle and ask for strength from him to face situations that we normally could not deal with or, turn to our own resources without him. Struggling with him is struggling well, struggling apart from him is struggling poorly. So, we can’t get rid of the groaning. It’s all around us, in front of us, behind us, upon us. Given this reality we make our choice. We can begin grumbling about the situation which eventually leads to grasping for control. Trying to control everything around us to relieve us from the groaning. Unfortunately that never seems to work for the long run. It may relieve us for a few days our weeks or possibly a few months, but it does not have the power to last over time. Groaning, Grumbling and Grasping never creates a heart of Gratitude and Thanksgiving! It creates a prison of continual grasping with an unquenchable appetite for more. As believers, we are encouraged to turn to Christ in the middle of hardship and struggle. (Matt.11:28-30) When we do he provides the way for gratitude to settle into our soul and we leave grasping behind and turn to a lifestyle of giving to others, even when we ourselves are weak and in need. This is the miracle of Gods transforming power. We become overcomers like Shadrach, Meshach and Abednego and a whole Bible full of examples of overcomers. In addition History is full of overcomers like Hudson Taylor, George Mueller, William Wilberforce, Amy Carmichael and a cloud of witnesses that cheer us on today. Secondly, I observed during our meal, the overwhelming attitude of everyone was that of gratitude and thanksgiving. Mom was with us and shared the deep loss of Dad and the reality of living alone, but she concluded with an expression of thanksgiving for having experienced 40 wonderful years of marriage with her husband and friend. That opened the door for others to share their heart of thanksgiving in the middle of struggle. We discussed as a family the actual power of a heart that is thankful. How it transforms our thinking. How it frees our soul to focus on the good that God is doing. How it becomes contagious to all those around us. And, how its focus is outward, not inward. We discovered as a family how to worship God in the midst of struggle. And in fixing our eyes on him leads us to serve others no matter what our personal challenge is at the time. Wow, what a wonderful day. As a father I was so blessed to have such a discussion with my family. Thank you Father for guiding my family towards a heart of gratitude this year, even though it has been full of groaning, hardship and struggle. 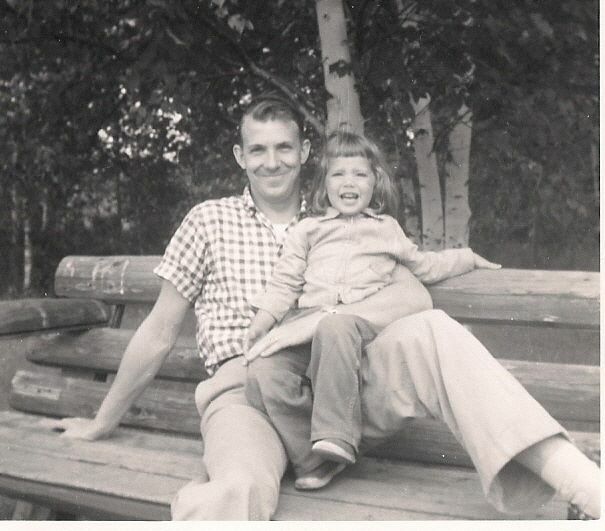 I’ve included a picture of Gail and her incredible dad who she only has good memories of. She is so thankful for the 56 years she had to live life with him! He deeply influenced my life as well modeling for me consistently for 33 years what a Godly man, husband and father in reality is like. And I am so thankful for the time he poured into our family. We learned from him what a heart, soul and life of gratitude looks like. Thanks for sharing, we too are thankful for you and the friendship of your family and the blessings we have received from spending time with your family. We had a great family share time centered around Proud people cannot be grateful. Gratitude presupposes a recognition of someone greater than ourselves who gives us our life, sustains us and blesses us beyond measure. Gratitude comes from humbling ourselves before Him. great post dad. great blog.